We carry a very large selection of contact lenses and will ensure you get the best brand for your particular eye needs. Contact lenses are the preferred choice of many people with poor eyesight. The key to successful wearing of contact lenses is a thorough exam, the right prescription and choosing the right type of contact lens. We excel in contact lens fitting and care for adults, teenagers and children. You will be professionally fitted with contact lenses that are comfortable and give you excellent vision. We carry a full range of high-quality contact lenses from top manufacturers at reasonable prices. Contact lenses are more versatile than ever before. We can provide you with virtually any type of lens that’s available today. This includes both hard and soft contact lenses in a variety of brands that include Focus Dailies, Aqua Comfort, Cvue, Acuvue Oasys, Air Optix, Clarity H20 and many more. Daily wear: These are usually the least expensive soft contact lenses option. You wear them during the day, and remove them at night and throw them out. They’re more comfortable and more difficult to dislodge than hard contact lenses. Extended wear: Available for overnight wear in soft or hard lenses. Can usually be worn up to seven days without removal. Extended wear disposables: These soft contact lenses are available for overnight or continuous wear ranging from one to six days and then discarded. They require little or no cleaning and there’s minimal risk of eye infection when instructions are followed. Planned replacements: The majority of soft contact lens wearers are prescribed some type of frequent replacement schedule, most often every two weeks. Simply use them for the recommended time frame and then discard them. Colored contacts: These contact lenses can change the appearance of your eye color or merely enhance your natural eye color. No prescription is required when only changing or enhancing eye color. Bifocal contact lenses: These are for people suffering from presbyopia (age-related problem with vision) or astigmatism. Bifocal (and multifocal) contact lenses are made by various manufacturers. Hard contact lenses: Hard contact lenses, also known as rigid gas permeable lenses (RGP), offer excellent vision for most vision problems. They tend to be more economical than soft contact lenses since they’re more durable and last longer. They’re especially appealing to people who have tried soft contact lenses in the past, but haven’t been satisfied with the results. Dr. O’Donnell does a thorough exam to ensure your success in wearing contacts. 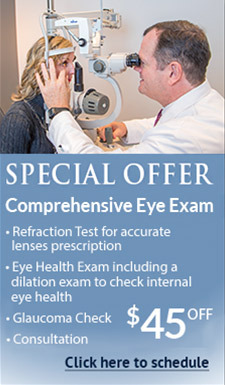 Dr. O’Donnell conducts a thorough eye exam to get you the exact right prescription for your eyes. 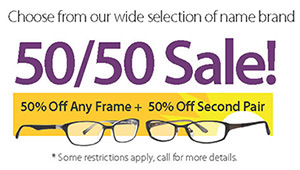 Once the exam is complete, Dr. O’Donnell chooses the best lenses for your eye needs. These are fitted and tested for comfort and accurate vision and, as needed, other lenses are tested until you are completely satisfied. If you have been having trouble wearing contact lenses, or you have been told you were ‘hard to fit,’ chances are Dr. O’Donnell will be able to help you. Using a variety of high-tech testing and measuring tools, he can fit you with a comfortable prescription. Dr. O’Donnell will take the necessary measurements to fit you with contact lenses. 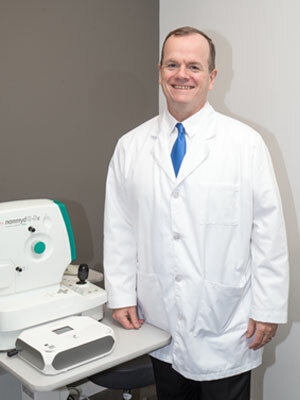 He uses a variety of eye measurement equipment to measure the shape and area of the cornea, as well as to diagnose for astigmatism. Then he’ll determine a contact lens to dispense for a trial period. This trial period helps you decide if you like both the comfort and wearing schedule of your contact lenses, and is a chance for you to make sure the prescription is just right. At a follow-up appointment, Dr. O’Donnell will examine your vision to see if your prescription needs be adjusted to improve your vision quality. Additionally, Dr. O’Donnell will check for fit and comfort to make sure you are totally happy with your new lenses. When the comfort, fit and vision is acceptable to you, then Dr. O’Donnell makes your final prescription. New contact lenses wearers will be trained on proper technique for insertion and removal and contact lenses care. They’ll also discover how to properly clean and care for their contact lenses. Dr. O’Donnell will work very hard to ensure your contact lenses fit you right. His extensive knowledge and expertise enables him to fit contact lenses successfully even on patients who have had difficulty wearing them in the past. If you have a current contact lens prescription on file with us and would like to order more lenses just fill out this form and we will call you back as soon as possible to complete your order and ship out your lenses. If you contact us outside of our normal business hours, someone will call you on our next business. If you aren’t a patient of ours, please have your current prescription from your eye doctor with you when you come to the office. You do not need to note lens or prescription details on this form. Simply use this form to let us know you would like to order contacts. Your information will be gotten over the phone to complete your order.